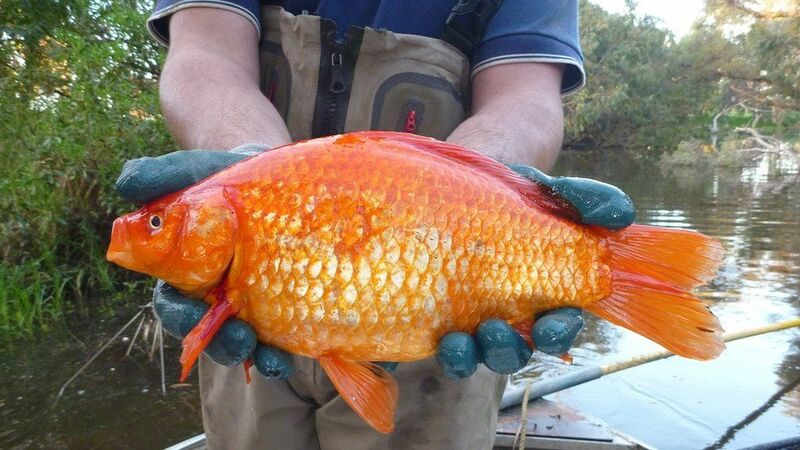 If you’ve ever released a pet goldfish into the wild, you probably didn’t expect it may get as big as a football. But researchers from Murdoch University in Perth, Western Australia, have tracked these huge fish travelling hundreds of kilometres in just a year. Goldfish are native to eastern Asia but are now a common pet around the world and considered one of the worst invasive aquatic species. Once released, they can have a big impact on local ecosystems. Dr Beatty says the team found many goldfish which weighed in at over a kilogram, while the biggest was measured at 1.9kg (4lb). “Our research discovered the fish displayed a significant seasonal shift in habitats during breeding season, with one fish moving over 230km (142 miles) during the year,” says Dr Stephen Beatty, from the Centre of Fish and Fisheries. This study should help with species control in the future, he adds. Goldfish like this can also harm water quality, introduce disease, disturb habitats and compete with native species, threatening their survival. The RSPCA says a “common misconception” about goldfish, which are a member of the carp family, is that they live for five years and grow to 12cm (4.7in) in length. “The fact is they’re known to live for up to 25 years and some can reach over 40cm (15.7in),” the charity says. Tish, the record-breaking goldfish from Thirsk, North Yorkshire, died in 1999 at the age of 43. Owner Hilda Hand, 72, said she buried him in a yoghurt pot in her garden. “Goldfish are supposed to have a four-second memory, but I’m sure Tish recognised me,” she said. Goldfish can enter waterways when the contents of an aquarium is dumped, so the advice is not to empty tanks with live animals in them. The RSPCA advises contacting the place where you got the pet from in the first place, if you are no longer able to care for your goldfish. If they are unable to help, then look for a charity which specialises in rehoming fish.